If you installed lot of themes on windows 8 operating system and when you try to delete all those themes, then you will notice that we cannot able to delete all those themes at once. In this post you will see how we can easily remove all installed themes at once. I once downloaded lot of windows themes on my PC, I think it is around 30 themes. After downloading I installed all those on my PC. I enjoyed those themes for few days, after day passes I got bored seeing the same themes; that time I decided to remove all current themes. When I tried to remove those themes I noticed we need to remove them individually to delete those themes. 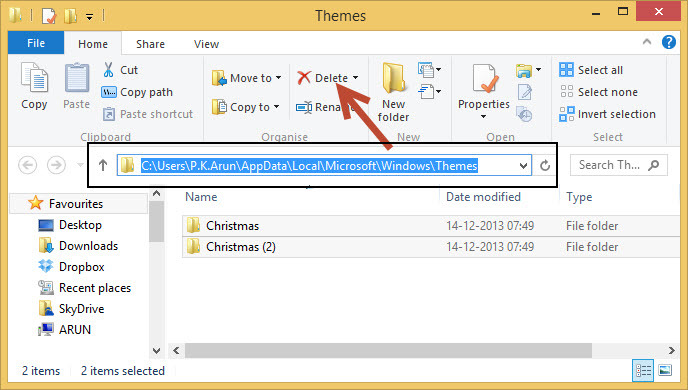 By default we can remove any themes by selecting those theme and right-click and choose delete option to delete theme. Removing 30+ theme one by one is really a time consuming process. It is really not the best practice to go that way. That time I started to think differently. After sometime I got an idea like removing themes from the source itself. It means somewhere our installed themes files should be there on our computer and we need to delete those files to delete or uninstall themes. After trying this method I got succeeded to remove all those themes at once. By this method we can remove all our themes within few seconds. This is really dead easy method. What we are going to do is, we are just going to locate the installation location of windows 8 themes (.deskthemepack) on our operating system and then we remove those themes files to remove installed themes. In windows 8 when you install any themes all files are extracted to or installed in below address. This directory contains only the themes that you have downloaded from the internet and not the themes which comes default in windows OS. 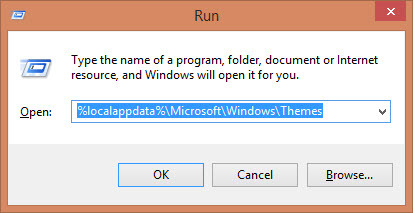 If in case you need default themes location, then it is installed in C:\Windows\resources\Themes. To open that directory, open run prompt by pressing Win+R key on your keyboard and paste the first location address into the run prompt box and click OK button. Once you click ok button you will be in the theme folder. The content you see on this folder is the themes which you have installed on your windows 8 OS. 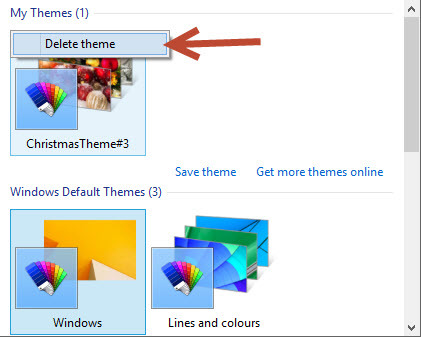 So to delete your installed themes just select the folder one by one to delete selected themes only or select all the folder if you need to delete all your themes and delete those folder. Once you delete those folders you can go and check themes in My Themes section– your themes will be deleted if you deleted those folders.